The rally was one of more than 600 simultaneous events held around the globe Saturday in support of scientific research. About a thousand people marched up Congress Street from City Hall to Congress Square Park on Saturday morning to express their support for science and scientific research. 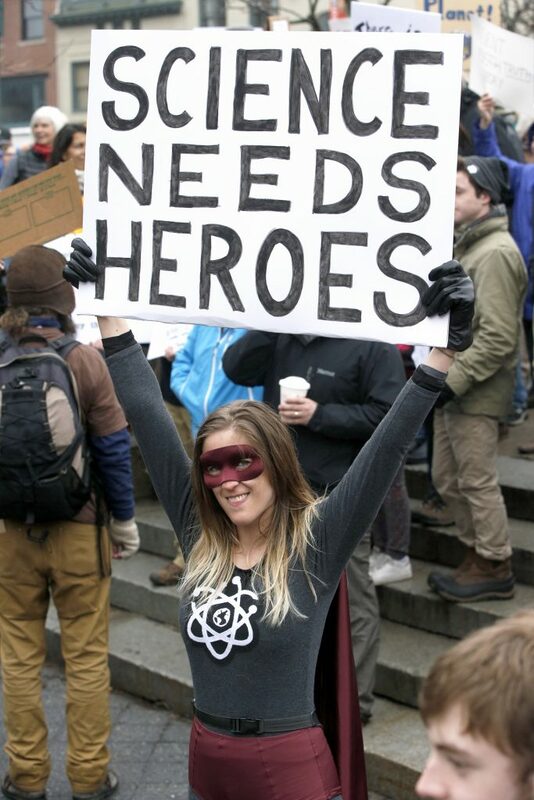 One of more than 600 simultaneous events held around the globe to support the March for Science in Washington, the Portland gathering featured speeches, an array of signs – many of them humorous – and a lot of scientists. It was one of six such rallies in Maine, the others slated for Gouldsboro, Orono, Sanford, Machias and Unity. The march, which coincided with Earth Day, was the brainchild of several scientists who believe scientific endeavors are being threatened by the Trump administration, which has proposed big budget cuts to federal agencies that fund scientific research and has cast doubt on climate change science. “Science is being ignored by a large section of society and the administration. Their time scale of interest is too short, at about five years. 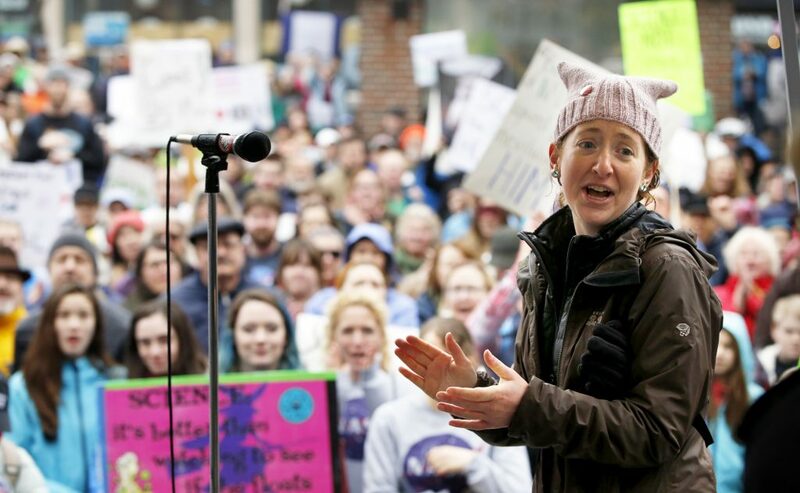 Mine is 10, 20, 30 or 40 and then my kids’ will be longer,” Matt Duvall of Auburn, senior director of strategy and analysis at Bates College in Lewiston, said at the Portland rally. 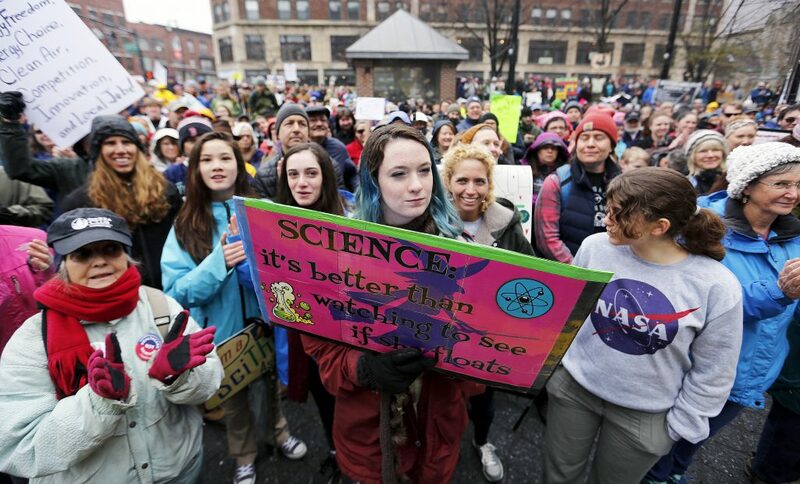 Duvall was with a contingent of Bates College scientists at the march. 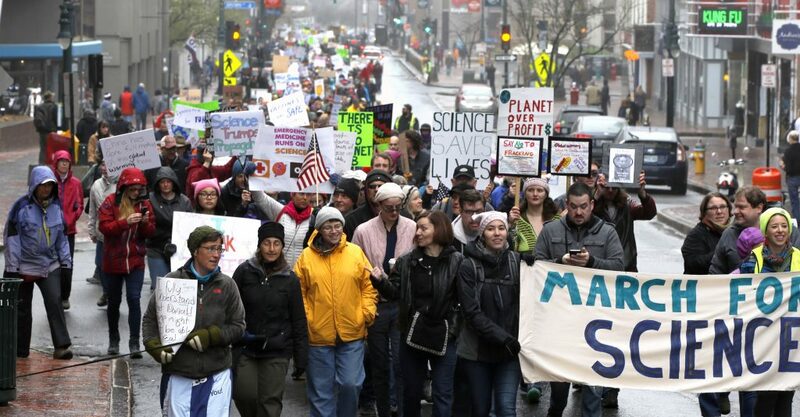 Organizers have proposed a “Week of Action,” encouraging people to register to vote and take part in community science projects in the coming week, culminating in the People’s Climate March on April 29 in Washington and other cities. Some scientists declined to support Saturday’s marches over concerns that the events would politicize science, which is fact-based and data-driven, and lead people to link science to a liberal agenda. 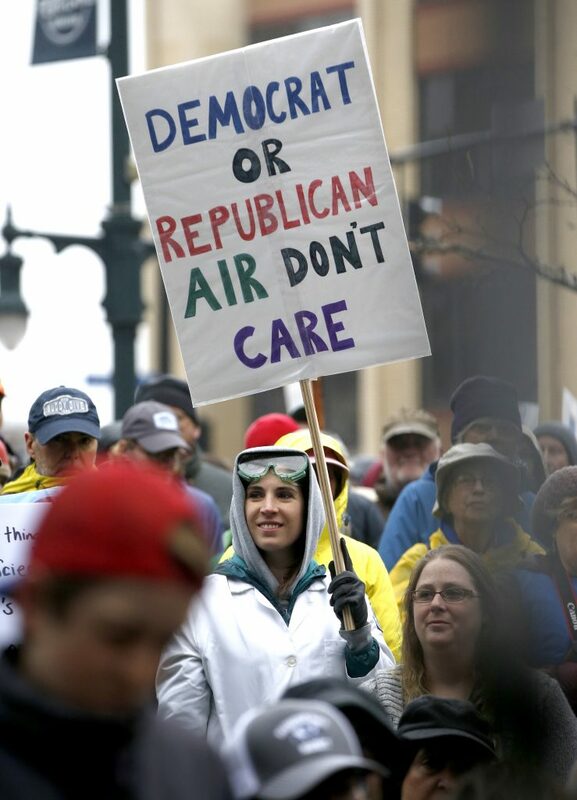 But the scientists who showed up Saturday in Portland said they had few, if any, qualms about supporting science publicly. His wife, Paula Schlax, a chemistry professor at Bates, said she just wanted to celebrate all the things science has accomplished. “Vaccines, chemotherapy, clean water, clean air. I really want to celebrate that,” she said. Ruth Kermish-Allen of Appleton, director of the Maine Math and Science Alliance and a social scientist and ecologist, said her biggest concern is that scientists don’t communicate or share their work with everyday people. “Hopefully today is a start to bringing about a change to that,” said Kermish-Allen, who was accompanied by her daughter, Elena, 11. 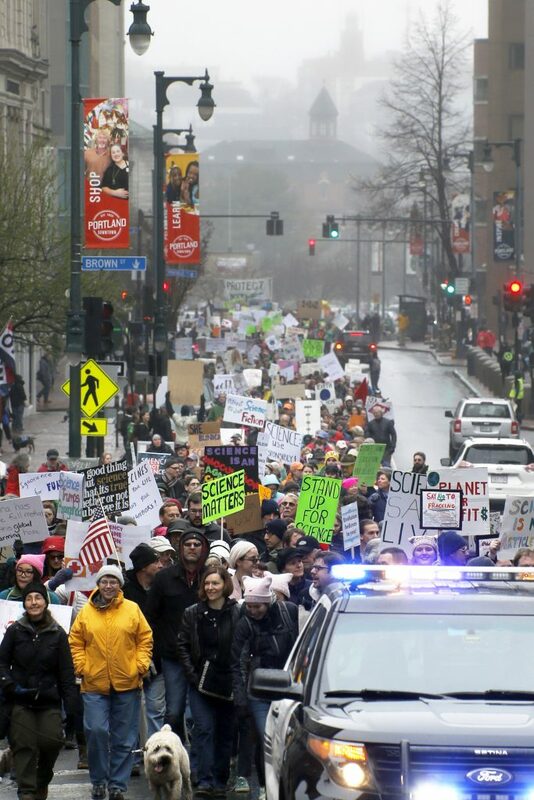 The marchers were quieter than the estimated 10,000 who descended on Portland as part of the Women’s March on Jan. 21, the day after President Trump’s inauguration. 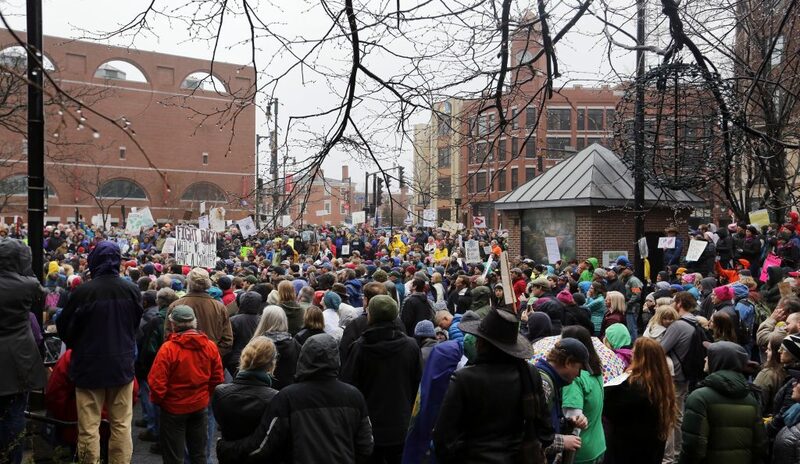 It was one of the largest protest marches ever held in the city. But the signs were clever and the array of costumes humorous. “It becomes politicized when the facts become inconvenient,” said Tom Gilbert, Meunier’s husband and a water quality specialist for the Maine Forest Service. Dan Holman of Mount Vernon, a middle school science teacher, marched with his daughter, Claire, 12. Not everyone at the rally was involved with science. 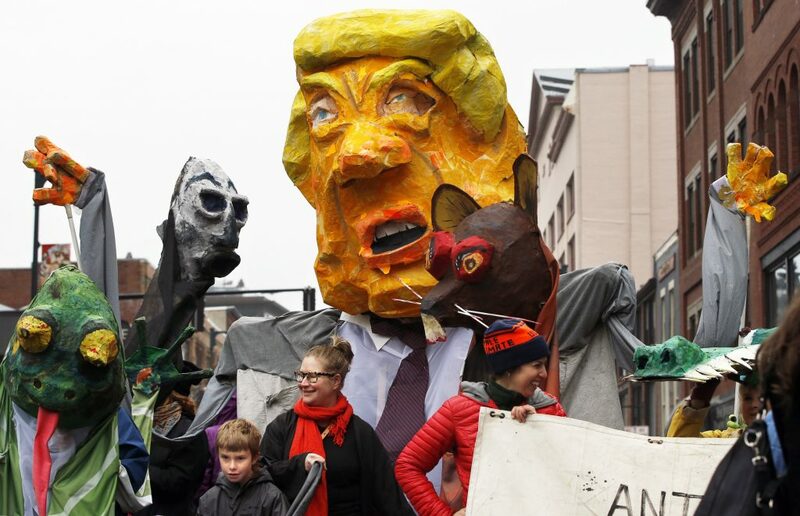 A group of Portland artists brought up the rear of the march – dressed in towering puppet costumes depicting Trump and his “swamp” Cabinet. The group intends to march at the People’s Climate March in Augusta on April 29. The costumes will then go on display at Space Gallery at 538 Congress St.